Walking through a tea garden on the gentle hill slopes of Darjeeling and seeing the tea processing is always a special experience. And a great way to experience this is by visiting the Happy Valley Tea Estate which is located about 3km (1.8 miles) away from Chowk Bazaar area. The approach is through a narrow winding downhill road which is quite steep. So if you are walking, the walk on your way back is likely to be quite cumbersome. But the rewards on the way are enormous. There are some points on the way from where the mountain vistas are simply spectacular. And you will pass by local homes and cottages. The narrow road is named after T P Banerjee, a rich Bengali man from the Hoogly area of West Bengal. He took over the Tea estate from the original owner David Wilson in 1903. Wilson, an English man, originally established the estate in the year 1854. At the entrance of the factory, there is board that still shows the year of original establishment along with the name of the estate. During the time of Wilson, the tea estate was known as Wilson Estate. T P Banerjee bought another adjacent tea estate called Windsor Tea Estate in 1929, combined the two and renamed the whole estate as Happy Valley Tea Estate that spans across more than 270 acres. 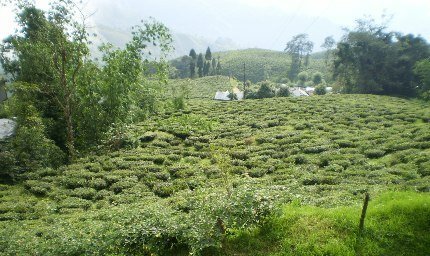 This is the nearest tea estate to Darjeeling town and the most convenient one to reach. Since 2008, the tea estate has been taken over by Sanjay Bansal. Happy Valley tea estate is located at the end of a narrow downhill road Road. You can see the beautiful tea garden on the hill slope as you come near the end of the road. From a distance, you can see the large white colored building with slanted tinned roof which is the tea production factory. There are guides who will offer to take you inside and show you the various stages of tea processing and explain the steps. They are usually employees of the factory acting as guides during their off time and charge a fee for the factory tour which lasts for about an hour. You will first enter into a huge hall where plucked teas are kept on elevated wooden beds for a processing known as Withering where the moisture content in the leaves are reduced. There are different qualities of tea. The number 1 or the best quality comes with a single bud with two leaves, the next quality has one bud and three leaves and so on. The best quality tea at Happy Valley Tea Estate is known as SFTGFOP (Super Fine Tippy Golden Flowery Orange Pekoe) which is normally produced during the first flush or sometimes as Supremo (second flush). Within this there are variations like White tea, Green tea and Black tea. The regular quality tea at the estate is known as Family Mixture. Most of the tea bushes in this estate are nearly 100 years old, some even older. From the adjacent room and through pipes that run below the beds, hot air is pumped in during the night time. This is how the moisture reduction (i.e. initial drying of leaves) takes place. Up to 65% drying takes place here. As you walk into the adjacent room, you will see the giant fans that actually pumpthe hot air through the pipes. The dried up tea leaves are then taken for further processing in a large room at a lower level. Climb down the spiral stairs through an opening in the room and you will reach a glass covered area from where you can watch the remaining process taking place at a level below. About 110kgs of tea leaves are transferred below at a time for rolling which takes place for about 45 minutes. In case of Black Tea, the next stage is fermentation. Other tea types skip this stage and proceed directly to the stage where 100% drying takes place in imported machines. This is followed by cutting and sorting. You can clearly see the large vibrating machines are separating out different qualities of tea leaves automatically. The best quality tea comes out from top while others through different channels. Finally the last stage is packaging. At the end of the tour you will be taken to the factory outlet where you can sample and taste various types of tea produced in the estate. If you want, you can also buy tea here. There are seasons for different types of tea. Green and little bit of White Tea are plucked during March to May. June to August is the season for Black Tea. September to November is again the season for Green and White Tea. During the other months (December to February), teas are not plucked and the machines do not operate. However you can always get a guide who will show you the premises and explain the processes. The tea produced at the Happy Valley Tea Estate are all exported. Harrods in London is the main distributor of the tea. So if you want to buy the Happy Valley tea in India, you can do so at the factory outlet in the estate here in Darjeeling. You can also buy pack of tea bags. If you want to just taste a cup of best quality Happy Valley Tea in Darjeeling, then there is another way. There is a small tea shop right next to the factory, Happy Golden Cafe which is run by a local lady. She has samples of the estate tea which she apparently collects from the employees quota. This is where you can have a cup of excellent black tea for Rs. 25/-. The lady will make it for you from leaves plucked at the gardens here. The estate and the factory is open from 8am to 4pm from Tuesday to Saturday. There is a fee for the factory tour. The usual fee is Rs. 100 per person (they even conduct the tour for a single person). The factory employees usually act as the guides during their off time. 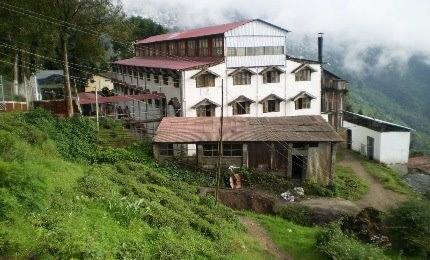 The factory usually remains closed from November to February because tea plucking does not take place during winter. You can however see the tea gardens from outside and there is no fee if you want to just hang around in the estate. Happy Valley Tea Estate is located 3km from Chowk Bazaar which is the main market area of Darjeeling lower town. If you come by a car or taxi, you can approach it from the Lebong Cart Road. There is a narrow road that leads to the T P Banerjee Road at the end of which the Estate is located. From the Chowk Bazaar area, you can also take the Lochnager Road which too leads to the T P Banerjee road. Remember, if you are coming by car and via the Chowk Bazaar, it may take up to 30 minutes to reach the estate due to the usual traffic jams in the market area. Taxi drivers at times may be reluctant to go such a short distance. You can also walk down from Darjeeling lower town in about 25-35 minutes. The T P Banerjee road (named after the Bengal's aristocrat Tara Pada Banerjee) is really narrow and winding down with a steep gradient. The road hasn't bee maintained for long and is full of pot holes. But views on the way are spectacular. Check out North Darjeeling Map to see the location of the Tea Estate. Sir, We several people from Kerala State, about 172, visited Darjeeling between 22nd May to 28 May, 2018 on an IRCTC sponsored tour program. Our itinerary had a visit to Happy Valley Tea Gardens. During our visit, we found several vendors put up kiosks at the road side selling Darjeeling Tea. From the stalls, several of us purchased significant quantity of Darjeeling tea. 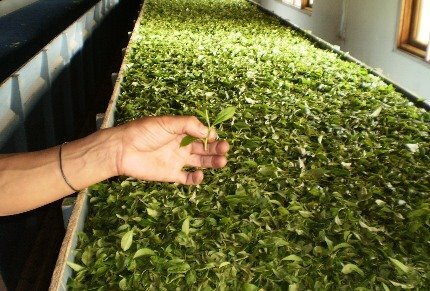 We have been told that these are first quality tea leaves sold by the factory. Sir for you to know, the drivers of the jeeps, which took us there, parked their vehicles in front of these kiosks and told all of us that "you can get the best Darjeeling tea here". We were asked to purchase from the kiosk in front of which the vehicle is parked. My attempt to buy from another kiosk was met with a reply from the shop keeper "please buy from the shop near your vehicle". To convince us further, they (the kiosk owner) made tea right there and gave us and told that this is the very same tea leaf we are buying.. Of course it was at a cost of Rs.10.00 per cup (a very small one indeed). To our great surprise, we found that WE ARE CHEATED terribly. What the sealed packet contained is not tea leaf at all. Upon boiling, a foul smell of some kind of (rotten) leaf is emanating. The boiled water doesn't taste tea at all. I myself purchased 4 packets of normal tea and 2 packets of green tea. Having traveled to various places several times, I feel extremely let down this time. Sir this is a collective effort between the kiosk owners and the drivers and I don't know who else. I assume what we got is barely tea leaf at all. It doesn't have any aroma of tea. It's obvious that the Darjeeling Administration would be well aware of this organised cheating done so blatantly. That very feeling is hurting me more than being cheated. Dear Mr. Bhattacharya, One simple question, if we go to happy valley tea garden on the 5th or 6th of December, have they already stopped processing? Yes, unless they are processing left-over tea leaves plucked in earlier months. I would be most grateful if you could confirm that the Happy Valley Tea estate is close to the Old English Hill Cart Road Cemetery. My reason for asking is that my Great Grandmother was buried in this cemetery in 1907. I also have a photograph looking across the Happy Valley Tea Garden towards the main part of Darjeeling. Thanking you in anticipation, Best wishes. Hi, Yes, Old English Hill Cart Road Cemetery (known as Old Cemetery) is close to Happy Valley Tea Estate. The Cemetery is on Lebong Cart road. A narrow approach road from Lebong Cart road leads to the tea garden. You can see the location of the cemetery (trace Lebong Cart Road) and the Happy Valley (bottom left corner - the red strip) in this link. Yesterday, by a peculiar coincidence, when I entered Happy Valley Tea Estate into "Google" one of the entries that came up was for the famous London Tea merchants: "Whittards of Chelsea" and that they do a special package of Darjeeling Happy Valley Tea from this single tea estate. They also have a branch in Glasgow, and since I was there today a packet was duly purchased. So as I write this message I am enjoying a fragrant cup of Happy Valley Tea. While a bit sentimental I'm sure you will agree that it is rather a poignant family association.